If you’re like most cat owners, you’ve probably bought your cat one of those catnip stuffed mice from the pet store. Maybe your cat rolled around with it in ecstasy and then proceeded to dissect it. Or, maybe your cat gave it sniff and walked on by, tailing swishing in the air without a care. Perplexing isn't it? Turns out either reaction is common and you'll see why in a moment, but first, let's look at the herb itself. This herb originates from Europe and Asia. The Latin name is Nepeta cataria, and it "has long been associated with cats. Even its Latin-derived cataria means 'of a cat.' And research shows that cats big and small adore this weedy, invasive member of the mint family." (Source) As an herb, it's a completely natural source of, shall we say, "excitement"... as you know if you've seen a cat in the throes of a catnip high. How Does it Affect Your Cat? As may know, cats who like their catnip, REALLY like their catnip. They’ll catch a whiff and next thing you know, they’re writhing on the ground, meowing loudly or otherwise acting way out of their normal character. It turns out that it’s a particular oil in the plant that cats react to called nepetalactone. When certain cats get a whiff of this, it replicates pheromones, which are chemicals that cause all kinds of “feel good” reactions that last roughly 10 minutes. According to The Humane Society, "The most intense catnip experience starts with the nose—one whiff of the stuff and your cat promptly goes nuts. 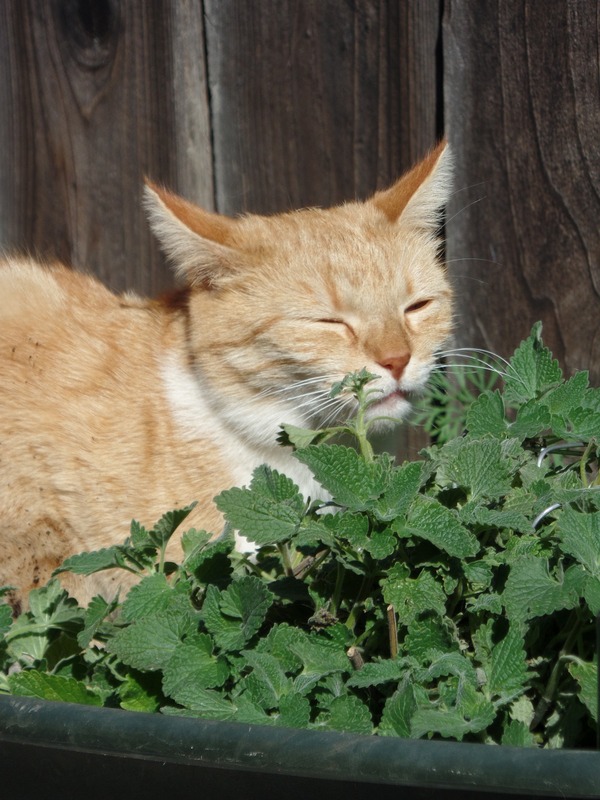 Researchers suspect that catnip targets feline 'happy' receptors in the brain. When eaten, however, catnip tends to have the opposite effect and your cat mellows out. Most cats react to catnip by rolling, flipping, rubbing, and eventually zoning out. They may meow or growl at the same time. Other cats become hyperactive or downright aggressive, especially if you approach them. Usually these sessions last about 10 minutes, after which your cat loses interest. It may take as long as two hours for him to 'reset' and become susceptible to catnip again. Be mindful of overindulgence though—cats are unlikely to overdose on catnip, but they can get sick if they eat too much. Trust your kitty to know when they've had enough." However, not all kitties experience this scenario. Why Doesn’t It Affect All Cats Alike? Also, be aware that while catnip is usually thought of as something that will “stir up” your cat, it can have the opposite effect, too. Catnip can calm and soothe some cats. As an herb, catnip is easy to grow at home. If you grow it, you may find your kitty indulging in it at intervals throughout the day and maybe even chewing on it. For the most part, it’s a fairly harmless indulgence. However, if your kitty eats a lot of it, it can make him sick, so if you see vomiting, then you'll want to relocate the catnip to a spot that's out of reach; then contact us for an appointment. Also note that if you buy a catnip- stuffed toy, it can lose its potency after a few weeks. That’s most likely why the cat who rubbed all over it initially has lost his interest. As you can see, catnip is a fun and harmless way to keep your cats entertained. However, if your cat shows no interest, there’s nothing wrong with him either; he probably just lacks the gene. What about your cat? Does he enjoy his catnip?